I thought it would be appropriate to start posting the DJ session Professor Z and I did back May at Mood Mosaic. I've put up 2 parts of the 4 part series featuring tracks by Xinga, Gil Scott Heron, Manzel, George Baker, Astrud Giberto, Lena Horn, Joe Cuba, and many more. 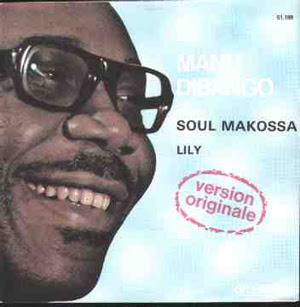 Here is a great article about one of my favorite tracks, Manu Dibango's Soul Makossa from our friends at http://www.tothedisco.com/. Manu Dibango's Soul Makossa is an important record not just because it has a most dancable african jazz groove but because it is the first record that club DJs truly made into a hit record. To read the rest of the article go to http://www.tothedisco.com/. Mood Mosaic is partnering up with Vampi Soul Records to bring you an exciting night of 60s latin, boogaloo, bossa nova, mambo, and salsa. 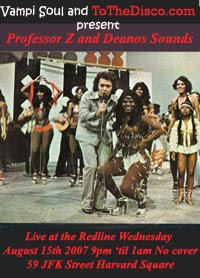 Deano Sounds will be joined by Professor Z of Weekend Warriors fame. To check out more info on Vampi Soul and to purchase some of their goods go here. I've finally launched the Deano Sounds Podcast. Every week I'll be digging deep in my crates to bring you the choiciest, rarest, and funkiest cuts from the likes of Fela Kuti, Eddie Bo, JJ Johnson, Jo-Jo and the Fugitives, Spanky Wilson, Byron Lee, Esther Phillips, Mark Murphy, Marcos Valle, Djavan, Som Tres, Joyce, Evinha, Jorge Ben, George Duke, Ray Barretto, La Charanga 76, Joe Cuba, The Harvey Averne Dozen, Willie Colon, Candido, Manu Dibango, The Chi-Lites, Ananda Shankar, The Cals, Betty Davis, Betty Wright, Speedometer, Nicole Willis, Bronx River Parkway, Village Crusaders, Cal green, Above and Beyond, Universal Robot Band, Prince Buster, Azymuth, Latin Brothers, Hugh Masekela, Tyrone and Carr, Joe Gibbs, Seu Jorge, Curtis Mayfield, West African Rhythm Brothers, and many more.